Traveling should be fun and exciting: you’re exploring new places, meeting new people and tasting local delicacies—what’s not to love? But it can also come with a lot of anxiety. For most of us with furry animals, the to-bring or not-to-bring dilemma is daunting. Of course you’d love to bring your pup everywhere—I get it, separation anxiety is real! But it’s also A LOT. Fluffy travel companions are Instagram-able, obviously, but they’re also exhausting and can add more anxiety when traveling to new places. That’s why I’ve come up with some helpful tips to put your mind at ease. Know your dog and their limits! Easy right? They’re already your best friend. But just because your destination is dog-friendly, doesn’t mean it’s friendly for your dog. Take into consideration how your pup handles certain situations, like: hiking, crowds of people, long car rides or lavish, king size beds. Side-note: there are restrictions on certain breeds in areas as well. A healthy dog is a happy dog! Your pup might dread it, but I’d recommend a visit to the vet before your adventure. Some lodgings require that Mr. or Mrs.Fluffernutter is up-to-date on all their vaccinations, while airlines need a certification of health. It’s also just good to know they’re healthy enough to go on a trip. Who wants to travel when they’re sick?I know I don’t! Oh, and while you’re doing the research, scope out the nearest vet clinics and 24-hour emergency vets around you. This app is very helpful: Red Cross Pet First Aid. If you buckle up, your Prince or Princess should too! It’s important to have your pup securely fastened on a plane or in a car. Roaming puppies (despite sounding adorable) can be dangerous, especially if they like to drive! American Kennel Club has some great car seat and crate options! 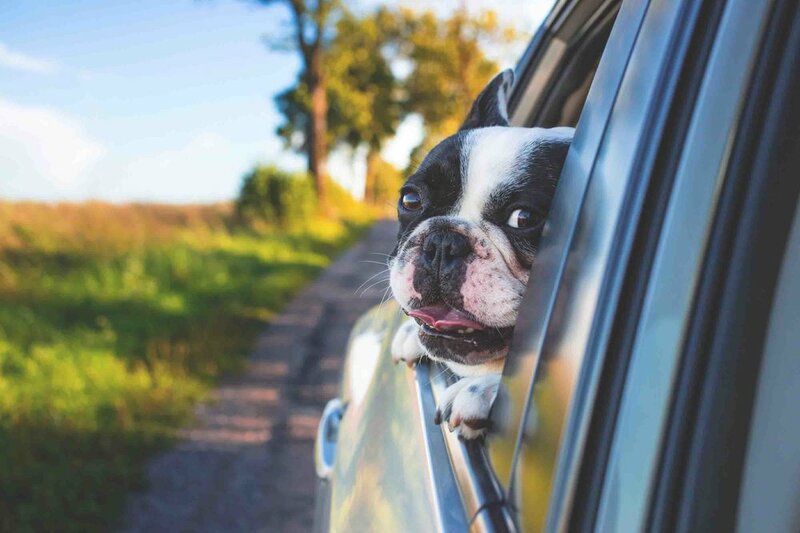 Most allow your pup to enjoy the scenery, helping to avoid motion sickness and their inevitable boredom. But if your dog’s not about that life, there are harnesses available, too. Airplane travel is tricky, and there’s, of course, more research involved (ugh!). They only allow USDA-approved carriers, and each airline has set specifications for them. The websites provided above go into more detail about this. To be safe, call the airline directly to ensure your puppy isn’t hassled during your travels. Don’t forget their suitcase! It doesn’t have to be fancy! But like you, they just cannot live without some of their things. Identification - And copies of them! This means their name tag, travel documents, and in some states and most definitely for international travel, their updated vaccination records. Transportable food and water bowls - including extra amounts of their food.Traveling is not the time to switch or try new food—things can get real stinky and messy! Leash, harness, puppy pads - taking breaks to walk and eat (if their stomach can take it) helps with anxious puppies. It burns off energy and tires them out, making for a relaxed pup and a calm car ride. Upon arrival, I’d also get them acquainted with the unfamiliar territory. Puppy pads! They’re always a good idea when flying. Favorite toys, treats, etc., that are familiar and comfortable! And like a child (because admit it, they are), it’ll distract them for a few minutes. Don’t feel guilty if it’s too much! If you think it’ll be too stressful for you or your cuddle monster, don’t fret! Sometimes it’s for the better. If you are traveling across country, for example, you can hire experts to transport your dog. There are also some highly-rated and trustworthy dog sitting options available, such as DogVacay/Rover and Wag. Safe and happy, tail-wagging travels!